My top 5 tips to be more Swiss! They always say the key to happiness nearly always has something to do with food, and as Switzerland has been ranked one of the happiest countries on the planet for the past six years, I figured this must have something to do with their cuisine too! 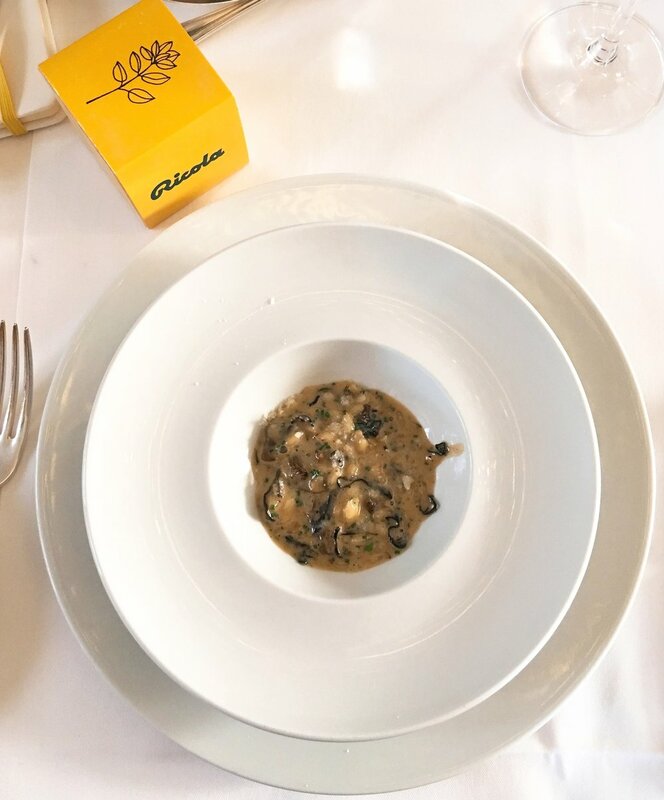 So when I was invited to try a bespoke Swiss menu at Mosimann's restaurant in London, and learn more about the key to Swiss happiness alongside it, I couldn’t wait to give it a try! Hosted by Ricola, a family business who have been creating natural herbal sweets in the fresh air of the Alps for over 80 years, they are experts in the balanced Swiss lifestyle. For our meal, we sampled delights of the Swiss culinary scene. For my starter, I tried a cooling chilled white gazpacho with grapes and almonds. This was followed by a delicious risotto al funghi. My main course was raclette stuffed courgette flowers with a thyme rosti and red pepper sauce. The flavours in this dish were incredible and really channelled the flavours and traditions of Switzerland through the raclette and classic rosti. Dessert was the most beautiful of them all; the duo of chocolate mousse was just divine to look at and eat! During our delicious meal we heard from speakers about the secret to Swiss happiness and how a few simple changes to our lifestyle can help us all rebalance our lives. Having heard from Swiss chefs, Swiss citizens and etiquette specialists, I realised there are lots of quick and easy ways we can all be more Swiss and improve our health and well-being in the process. Here are five top tips which I picked up during the meal, and I’ll be embracing these this Summer to be more Swiss! 1. Get some fresh air - regardless of the weather! Switzerland is renowned for its natural beauty, and the Swiss make the most of their stunning surroundings. In fact, hiking is a popular Swiss pastime and they often fill their weekends with mountain walks. Although the scenery in cities in the UK may not be as awe-inspiring, I will certainly try to spend more time outside as it can really make a difference to your day. I’ll be making small changes like getting off a stop early and walking to work, as well as walking around the block for part of my lunch break. Not only will this contribute to my exercise quota for the day, but the fresh air and sunshine also promotes positivity. 2. Be on time and don’t rush! Switzerland is synonymous with timekeeping, both in terms of their transport as well as the vast number of luxury watches produced in the country. Punctuality is a habit I’d love to have, as I noticed being late and in a rush all the time just leads to heightened stress-levels and anxiety. I’ll be waking up a few minutes earlier in the mornings to make sure I’m facing the day fully prepared rather than rushing around London all day long! Life expectancy in Switzerland is 83, which is an impressive 11 years higher than the global average. Although there are a number of reasons for this, part of it is their attitude to work. The Swiss approach to work promotes flexible working hours and no over-time. I am guilty of indulging in over-time in order to complete a never-ending list of work - but this can be detrimental rather than productive. I’ll be prioritising more and not taking work home in the evenings in order to be more fresh and alert for work the next day! In Switzerland, it’s polite to greet everyone who crosses your path and simple “Grüezi” is used to greet strangers. This is not something Londoner’s are particularly good at and some of us can go a whole day without talking to anyone. This can sometimes feel quite lonely and I’ll be making more of an effort to greet more people, even if it is just with a smile! 5. Get those creative juices flowing! The Swiss have contributed a number of inventions to society, including, Velcro, cellophane, muesli, milk chocolate, Ricola sweets in many delicious flavors, and of course the Swiss Army Knife. Exercising your creativity and imagination is a great way of expanding your mind and getting out of a bubble. I’ve just bought some mindful colouring books and can’t wait to get creative! So whether it’s taking a walk on your lunch break, perfecting your timekeeping in the mornings or appreciating the great outdoors at the weekend, there are plenty of things we can be more Swiss to improve our lifestyle and well being. Which of these tips will you be adopting? For more tips on how to be more Swiss, visit Ricola's website. See my Switzerland travel post!